There was nothing to see of this hoop cataclysm if you were a Bulls fan with Golden State leading 92-50 at halftime and Klay Thompson already with 10 threes on the way to an all-time NBA record 14 in 24 attempts. Thompson scored 52 points in just over 26 minutes with Stephen Curry adding 23 as both sat after the middle of the third quarter. LaVine had a Bulls team high 21 points along with Antonio Blakeney, the latter who had 14 of his points in the fourth quarter. The Bulls started the fourth trailing by 36. 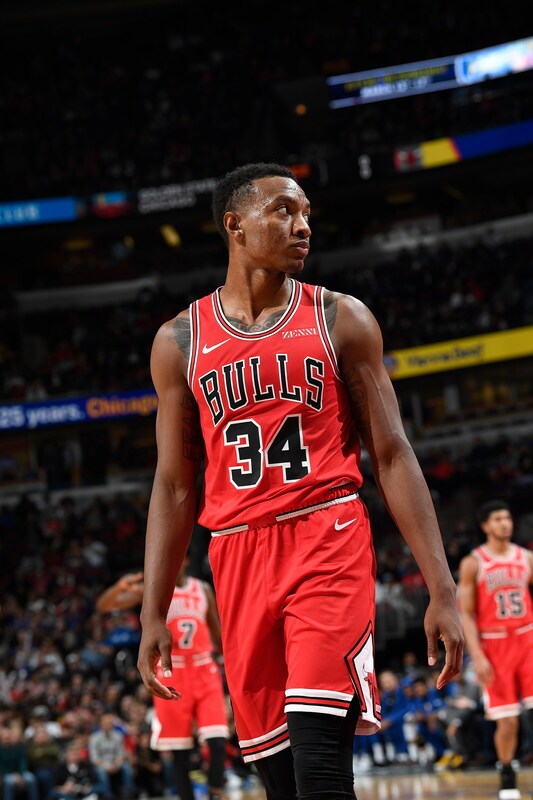 Wendell Carter Jr. probably played the best and most intense among the Bulls with a new career high of 18 points. Jabari Parker and Cameron Payne each had 15 points and Shaquille Harrison 13. The Warriors’ 17 first half three pointers also was an NBA record and it was the most points the Warriors scored in a half, breaking their record from the game Wilt Chamberlain had 100 points in 1962 for the Philadelphia Warriors. The record the Bulls eclipsed for points yielded was set in their 1966 expansion season. There was no reason to believe the Bulls could win against a team like the Warriors with Curry and Kevin Durant playing at a high level, and then Monday Thompson having his game of the season, if not one of the best of his potential Hall of Fame career. Which would make three hall of famers in their prime against a Bulls roster missing four of its top seven players including it’s top or second best scorer, its best point guard, its crucial energy and emotional player and its best three-point shooters. That the Bulls have won even two games this season seems a minor miracle given the major absences because the Bulls have yet to be favored to win a game this season. The Bulls are 2-5 and the Warriors are 7-1. Consider that much healthier and more talented teams like Oklahoma City, Houston and Washington have poorer records than the Bulls and the Lakers with LeBron James have the same record. LaVine for now, because of the significant manpower shortages, is probably the only starting Bulls player who would start for another NBA team. 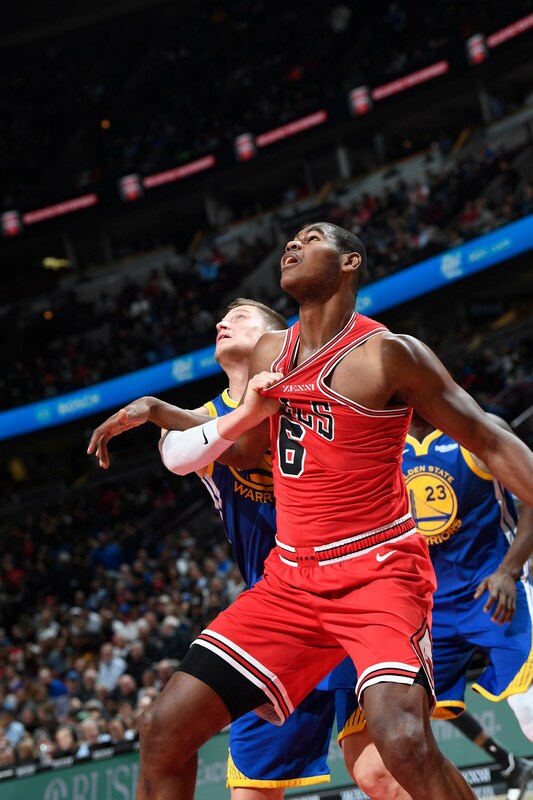 The prime of the bench is two players who spent last season in the G-league and Cristiano Felicio. Still, the lack of a competitive edge was especially noticeable as the Warriors in the their third quarter gambol seemed to toy with the Bulls in setting up Thompson for the record. It was a further indication of the unique camaraderie among the Warriors the way Curry urged Thompson to go for the record. Curry, of course, previously held the record. As Thompson fired away in the third quarter toward the record, even Bulls fans were cheering and reacting to his misses, ambivalent in their despair for the home team but excitement about being able to witness basketball history. It’s why in some respects it was a special night in the United Center, the one chance to see this historic Warriors team on the way to a third consecutive NBA title and perhaps many more. But it’s not just the numbers and records for this unique group, but the absolute joy and enthusiasm with which they play, the elite skill almost transcended by their devotion to one another. There was Curry, the record holder, on his own streak of at least five made threes in every game this season not taking a shot in the third quarter in order not only to set up the Thompson, but setting screens to get him open. And while being defended by Payne. And Kevin Durant settling for 14 points when he probably could have had 50. The Warriors had 34 assists. The Warriors clearly came in determined to help Thompson, who was just five of 36 on threes coming into the game. He was out of his slump in a few pop-a-shot minutes with six threes in the first quarter — taking much more difficult shots than the Bulls were — and 22 first quarter points. It was 44-28 Warriors after one quarter, and the marquee promotion of the season to see the Warriors was mostly now like an evening in the Louvre. This was a chance to watch the game as great art with ball and player movement, played at a rapid pace yet in control with uncanny shooting and precise passing. It was the epitome of what every coach teaches, what every fan hopes for with their team, a masterpiece of sport. No one but the Warriors plays like that in the NBA. Few teams ever have. For the Bulls, it wasn’t so much the margin of defeat since the 124 points was their own season high. It was an inability or unwillingness to get upset about being embarrassed like that. It was understandable on some level given the personnel with rookie Chandler Hutchison appearing almost in awe and little resistance from anyone even as the Warriors were making the Bulls look foolish as they sought out Thompson for what became his triumphant moment. Thompson did it wearing a headband look he dedicated to the Will Ferrell character Jackie Moon from the Semi-Pro movie. Heck, it did look like an ABA game the way the Warriors kept firing those threes with all but the red white and blue ball. Thompson ever the favorite long after the game was signing autographs for waiting fans even as his teammates waited on the bus to head back home from their road trip. 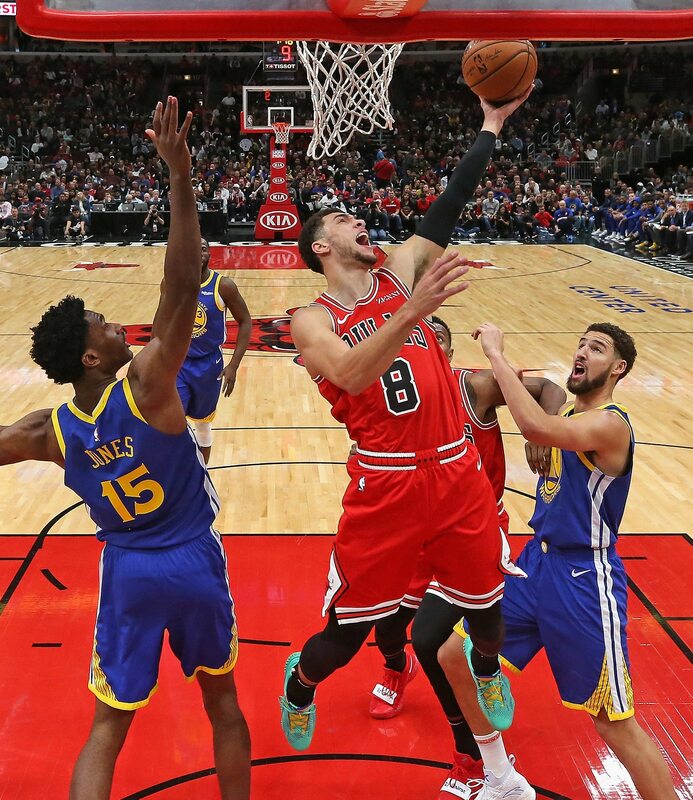 For the Bulls, it should be a night of reflection for being embarrassed on their home court like that and seeming to accept the Warriors seeking out records while Bulls players seemed to almost pose as spectators.